I recently received a free package of chili mix in the mail. Part of a contest I was in. After following the instructions on the box to make the chili, I discovered that it was not good. Not good at all. As in 8 people tried it and only one person had anything nice to say, and it wasn’t that nice. I was trying to think of other ways to use the spices rather than just throwing it out and came up with an idea. I kept thinking back to a pasta that Mrs. G had whipped up a few weeks ago. 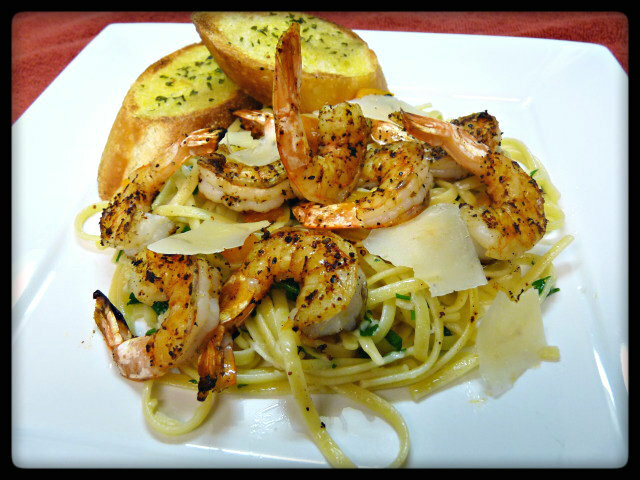 Grilled shrimp on a bed of pasta…sounds Awesome! Coming out of nowhere, fire roasted red bell peppers joined the party as well. Finally, my dish was taking shape. You may wonder why I went with an orange bell peppers rather than a green bell peppers (other than I can’t stand green bell peppers…YUCK!!). You may also be wondering what the difference is between a green bell pepper and an orange one is. 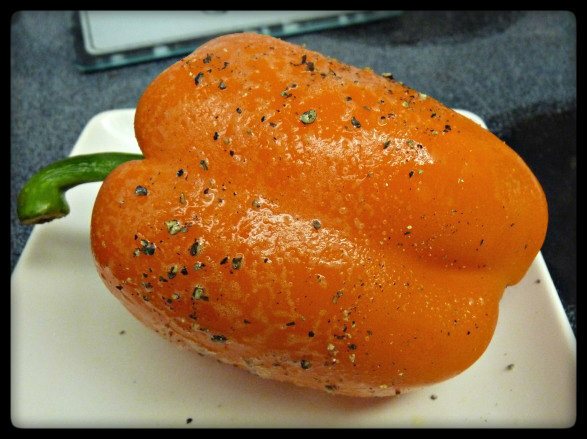 Orange bell peppers have been left on the plant longer to ripen than the immature green peppers and therefore have a sweeter quality. Green bell peppers have a tannic bitterness to them. Set up your grill for a direct cook at 400F (or medium high heat). Spray bell pepper with cooking spray and season with salt and pepper. Place pepper on grill and turn every few minutes until charred all over. 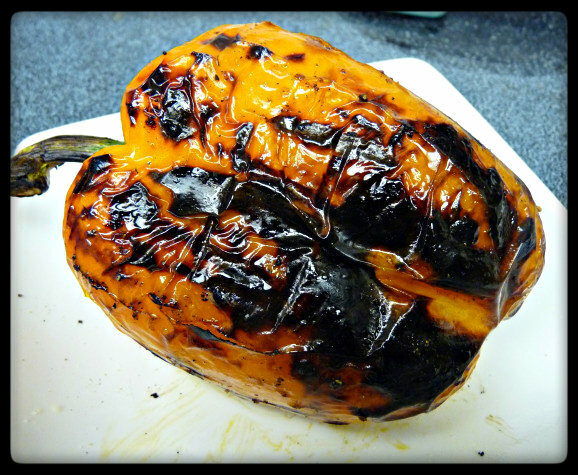 When charred on all sides, remove bell pepper, place in a bowl and cover with plastic wrap. Allow to sit for 5 to 10 minutes and then remove skin from bell pepper. Remove the seeds and veins from the pepper. Dice the pepper into 1/4 to 1/2″ pieces depending on your preference and set aside. Bring a pot of salted water to a boil. Add linguine and cook according to directions on the box. If desired, while pasta is boiling, slice up a loaf of French bread on the diagonal, butter each side and top with fresh parsley. 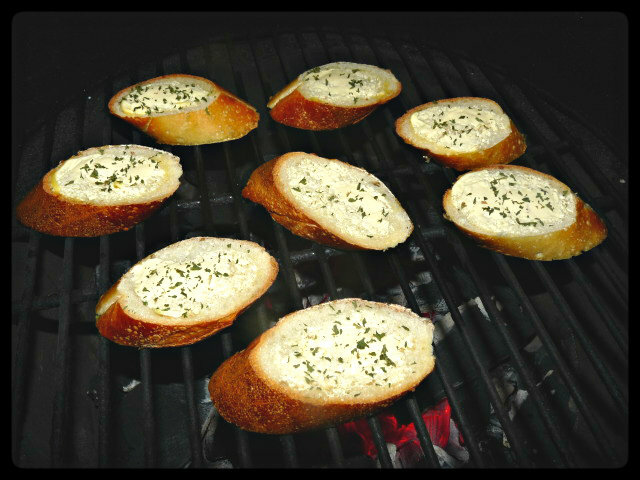 Grill for a few minutes per side until butter had melted and bread is charred to your liking. 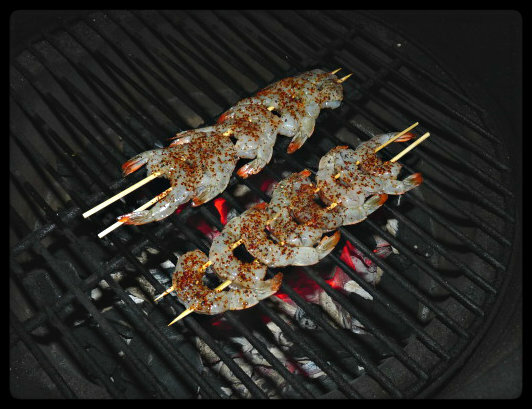 While pasta is boiling, place the shrimp on the grill (this can also be done at the same time you are grilling you bread). The shrimp will take about two minutes per side. You will know when the shrimp are done when they no longer show any of their original color and begin to turn a pink, orangish color. 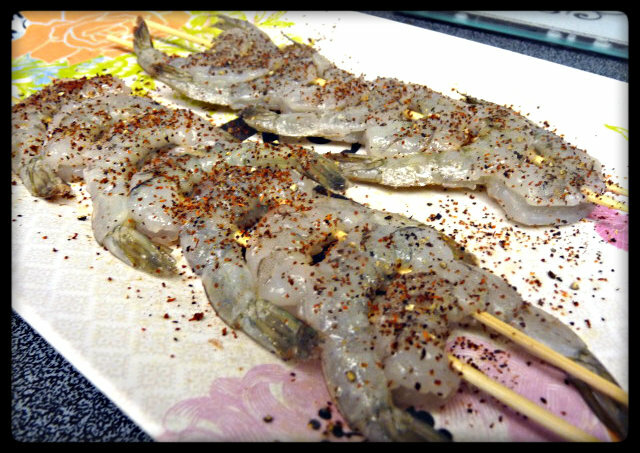 Do not overcook the shrimp or they will turn rubbery and will begin to lose their flavor. Once the shrimp are done, bring them inside and loosely cover them with foil while you drain and prepare the pasta. (Helpful tip – if you have two people, have one person begin grilling the shrimp the minute the pasta is done and the other person starts to drain and prepare the pasta). To prepare the pasta, drain and return to pot. Add the butter, parsley, diced bell pepper, and half the Parmesan cheese and toss well until the butter and cheese have melted. Divide among individual serving bowls or plates. Sprinkle the remaining Parmesan cheese on top and add the shrimp. Serve immediately. I thought this was an outstanding dish. The sharp, complex fruity/nutty taste of the Parmesan cheese played well the pleasantly sweet flavor of the orange bell pepper, but the shrimp was truly the star. The spices from the chili mix were a unique and complex addition to the shrimp, yet did not overpower them with heat. The salty, briney flavor from the sea really came through in the shrimp. If anything, this being a mild chili mix, the heat seemed to be lacking somewhat. If you are a heat lover, you may want to amp it up with some cayenne, ancho or chipotle powders. Great dish! i’m inspired to make something similar! i’d love to see how the chili mix goes in my own spice rubs and marinades. Very creative use of Chili mix, Jason — love the seafood spin. This reminds me a lot of a recipe I make but with a southwest spin. Definitely going to add my chili rub to it next time. Nice job. 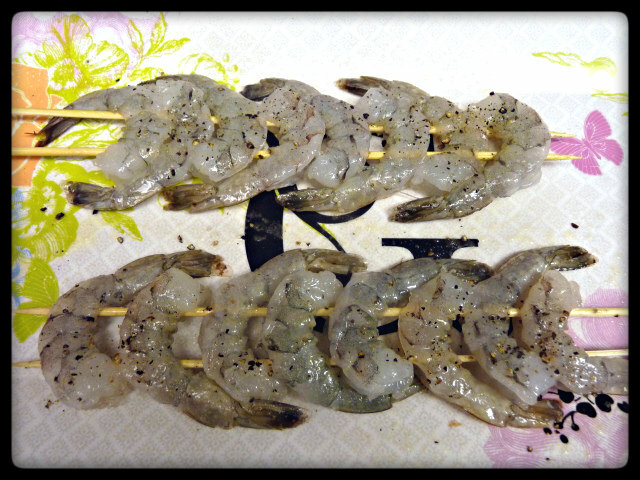 Love grilled shrimp. So quick and easy to make. It sound delicious, the presentation was inviting. The fact that it was cooked on the Big Green Egg could only make it better. Great job. Great idea and the dish looks amazing!!! Mmmm…chili dusted corn. Great idea. Good luck, Jason!Your dish looks ridiculous! Love the combination of flavors you got going on. Just had dinner and I want this. Only if I can have some of your burger and rings. They look great, Jen. Looks great!! If I had some to try on planked salmon or trout would be fantastic!! On salmon? Sounds like it would be tasty. Hi Griffin- Great looking recipe. I would make this for my wife. She loves pasta so I’m always looking for egged pasta dishes. …the seafood recipe looked and sounded wonderful. This looks really, really good! Love a good spicy shrimp and that was very creative using the chili mix to spice it up. 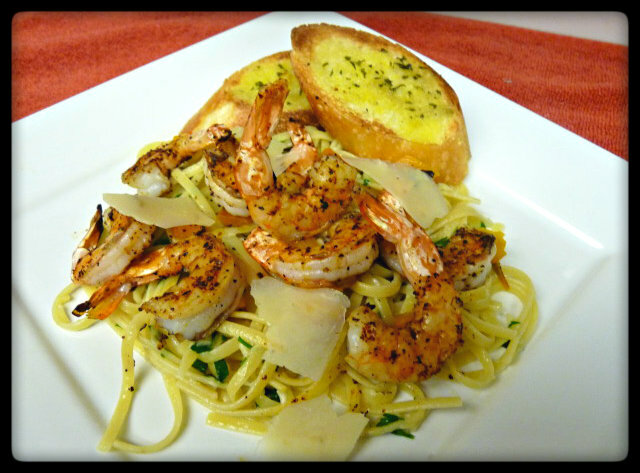 Great combination – spicy shrimp and pasta! Looks delish! 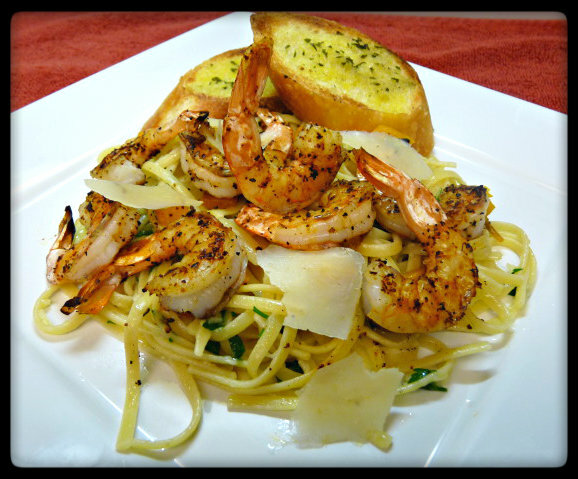 I love shrimp and pasta, so I will have to try this soon. Thanks, Audra. Still thinking about your taters and beans. Tonight might be the night. Hey Griffin, looks great, plated perfectly. Love the creativity. Thanks, Scot. I appreciate that.